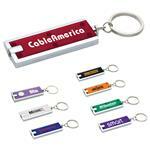 A unique designed promotional LED keylight in quality aluminum with your custom logo imprinted. Sleek and modern design in vibrant colors. Batteries are included. Key Chain attachment. 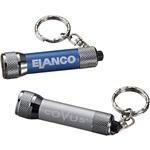 Promotional LED lights are known for their power and low power usage. Available Colors: Blue, Black, Red and Awareness Pink. Typical Imprint Area(s): 1.5" x 3/8"
Available Imprint Options: Laser Engraved. LED Curve Light, Batteries Included, Aluminum.